A basic recipe for crepes is very simple. Eggs, milk, flour and melted butter are combined to make a thin batter that can be cooked on a griddle or skillet. 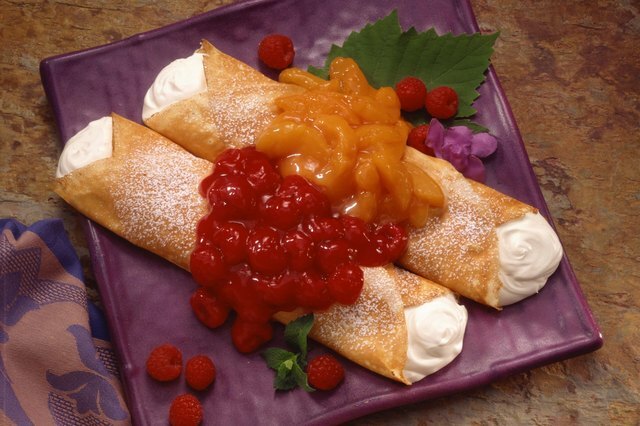 Crepes are often filled with either a sweet or savory filling, such as cheese, then topped with a sweet sauce, such as fruit topping. However, for health reasons, recipe creativity or because of a lack of product, you might need to find a butter alternative for your crepes. A number of ingredients -- some that are healthier than butter and some that are used to impart additional flavor -- can be used as a butter substitute for crepes. The most obvious substitute for butter is margarine. Traditionally made from vegetable oils, margarine has essentially the same fat and caloric content as butter. 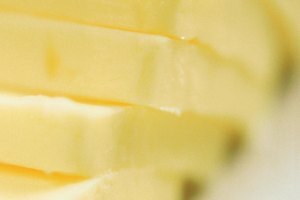 Where margarine beats butter is in cholesterol content, where it is much lower. Margarine comes in spreads and sticks and melts in the same way as butter, so it can be used both as an ingredient in crepe batter and in the pan to fry the crepes. 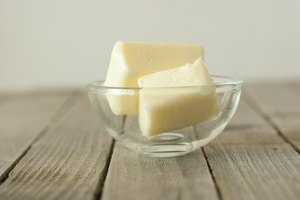 Another ounce-for-ounce substitute for butter is hydrogenated vegetable oil, also known as shortening. The hydrogenation process turns vegetable oils into a solid at room temperature. The most notable characteristic about shortening is that it has a higher smoke point than either butter or margarine, which means that shortening can handle a higher temperature before it begins to smoke and eventually burn. There is even butter-flavored shortening available commercially to enhance the flavor of items such as crepes. Melted shortening can be added to crepe batter in the same way as butter and can be used to coat the crepe pan as well. Regular vegetable oils, in liquid form, can be used as a butter substitute as well. The option of using vegetable oils can add an additional flavor element to your crepes. For example, if you are making crepes to be filled with a savory stuffing, oils such as olive oil or corn oil can enhance the flavor of your crepes. Other flavorful oils include peanut oil, sunflower oil and coconut oil. Vegetable oils have more stability than butter and can be heated to higher temperatures. Vegetable oils are also good for coating the cooking surface, but you need to adjust your recipe slightly when adding oil to the crepe batter. For every teaspoon of butter that the recipe calls for in the batter, use 3/4 of a teaspoon of oil. Rendered animal fat, such as lard, bacon grease and beef tallow, may not be as good as butter and certainly not as healthy for you as margarine or vegetable oil, but does add to the flavor of the crepes. For example, using bacon grease as a substitute for butter can greatly enhance the flavor of the crepes, especially if you are making them as part of a breakfast meal or savory dish. Rendered animal fat can be melted in the same manner as butter and used in the same amounts. 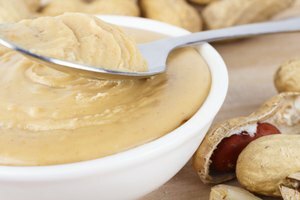 Can You Substitute Peanut Butter for Butter in Baking?